Also, I don't think Tom Cruise was right for his part at all. He just looks to damn smug in it and really stood out amongst everyone else. It had its moments though, I thought the opening was great. It looked gorgeous for the most part (partly due to seeing it on blu-ray I imagine) and Singer can create suspense like very few other filmmakers working today. Had some more attention been paid to the authenticity of everything and perhaps some different casting decisions been made than I feel this could've been one of the better WWII/Nazi films of recent times. As it is, it just feels like a sorely missed opportunity. Thanks for the comments . I wasn't really worried by the lack of authentic accents, too used to hearing very bad comedy accents on British TV, but I do take your point. To do a little rebuttal though this is a mainstream film to be sold around the world and it will be dubbed and subbed in many places and ways but for the main home markets they needed to keep it easy as there are film-goers and video-viewers who do not like to have to read films. Whether these same people went to see or even bought this film I've know idea. Re: Tom Cruise, in one of the featurettes in my UK edition Bryan Singer said something along the lines that he and Cruise had discussed working together after the release of The Usual Suspects and that once he had the script he thought of Cruise. Also it was implied that much of the co-operation from Germany in using original locations came from efforts by Cruise amongst many others. Also it was implied that much of the co-operation from Germany in using original locations came from efforts by Cruise amongst many others. I only remember from the German press, that they had big trouble getting permission to use original locations because of Tom Cruise's association with Scientology. Yes, for some reason I don't think that was even mentioned in the featurettes but I do recall a furore at the time. They didn't say how Tom had actually helped in getting the permissions just that he had and that in the end they were surprised at the level of access they eventually received. Overview: Twelve year old Oskar is an outsider; struggling to fit in at school and left alone to fend for himself at home whilst his mother works nights. One evening he meets the mysterious Eli. As a sweet romance blossoms between them, Oskar learns to overcome his tormentors and discovers Eli's dark secret and the connections to the gruesome events occuring across town. Together they must help Eli be gone and live, or stay and die. 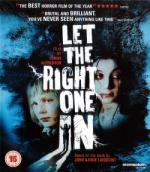 Brutal, bloody and tender, LET THE RIGHT ONE IN weaves friendship, rejection and loyalty into a disturbing and darkly atmospheric, yet poetic and unexpectedly tender tableau of adolescence. when we see Oskar being harangued by his mother after Lacke was killed in Eli's room and then Oskar locking himself in his room and closing the doors to his cars, Why was his my mum having a go at him? But apart from that a superb film. Overview: Directed by visionary genius Terry Gilliam, The Imaginarium of Doctor Parnassus features Heath Ledger in his last role, plus a stellar cast including Johnny Depp, Jude Law and Colin Farrell. 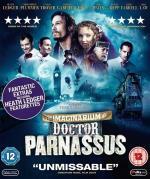 Dr. Parnassus (Christopher Plummer) is an immortal who leads a travelling theatre troupe. Their props include the 'Imaginarium' - a mirror doubling as a magic doorway into a world that makes your wildest dreams a reality. My Thoughts: Ok a strange film but then again not. Terry Gilliam in a weird phase, been there before and will be again, but making an excellent film which in places was very Pythonesque, not too sure if that is good or bad. There will be nuances and depths that I have missed in this first viewing, one thing you can't do with a Terry Gilliam film is to remove your brain and let it rest on the side, but hopefully they will appear and clear when I rewatch this in future. The basic premise is the usual fight between Good and Evil represented here by Doctor Parnassus (Christopher Plummer) as the Good and Mr. Nick (Tom Waits) as the Devil. Both these came over well and with good support from Verne Troyer, Andrew Garfield and Lily Cole as Doctor Parnassus's troupers. One of the main talking points about this film, also heavily touched upon by Terry Gilliam in his introduction to the film, was the fact that Heath Ledger died before his role had been completed. Three other actors, Johnny Depp, Jude Law and Colin Farrell, stepped in to save the film by taking on the uncompleted parts which luckily were those that involved Heath Ledger stepping into the Imaginarium. Did that work? I have to say that to me it appeared that yes it did work, I presume though that Terry Gilliam and his co-writer had to amend their original scripts to cater for this but it came over well. Yep, I know what he means there as the 3 become really different characters within the Imaginarium. One of the featurettes show Heath Ledger in some wardrobe tests which included when he was dressed ready for the first mirror visit, subsequently taken by Johnny Depp, and it looked like a continuation of the non-mirror character. Which maybe what was originally planned but once events happened and then Depp, Law and Farrell stepped in they had to play their mirror characters different to the non-mirror Ledger as they aren't Ledger. Overview: From the best-selling book comes this unstoppable fantasy adventure. Visiting a travelling freak show, 16-year-old Darren is bitten by a vampire (John C. Reilly). Newly undead, he joins the Cirque Du Freak and descends into a fantastic life with a sideshow of fabulous freaks, including Salma Hayek and Willem Dafoe. As war looms between the vampires and their evil counterparts, one boy's bravery will become humanity's last hope. 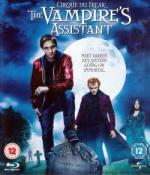 My Thoughts: Yet another vampire film, have to change my diet. I enjoyed this film which seemed to move along at a decent pace. The main cast and secondary characters, in general, came over well. I would have personally liked to have more of the back story but maybe that was too much to cover in this film, maybe I need to sort out the book(s) to find out. Although the film came to a conclusion it was also very nicely left open for sequels. Overview: When Chuck the astronaut (Dwayne Johnson) lands on a distant planet filled with little green people, he is surprised to discover that we are not alone in the galaxy. 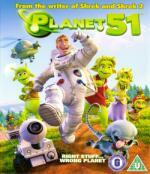 He gets the shock of his life when the residents of Planet 51 mistakenly believe that his presence is the start of an alien invasion of the human kind! Luckily Lem (Justin Long) quickly realises that Chuck is friendly and makes it his personal mission to help him return safely to his ship - with the help of Chuck's trusty pal Rover. My Thoughts: A rather enjoyable animated science fiction comedy. There were lots of references to other science fiction films throughout this film, my favourite was the pet alien. There were no real surprises and nothing really spectacular just generally enjoyable. I thought the voices came over well in their roles although I failed miserably to recognise a couple. Funuke: Show Some Love, You Losers! My Thoughts: A dark comedy it has been called, yes it is most definitely dark and there are some giggles to be had so I suppose dark comedy must be the best description but there wasn't a lot of laughs. A dysfunctional family is reunited because of the death of the parents but they have not reunited in grief. This film follows them as they try for retribution for events in the past and also to some degree try to resolve these issues. The director showed flashback sequences by using a darker colour palette as opposed to the generally bright imagery for current day events. Overview: In a post-apocalyptic, nuclear-scarred future the world has become a radioactive, neon drenched, industrial wasteland populated by the disenfranchised and the demented. Amidst the dust and decay of a poisoned landscape a 'Zone Tripper' manages to salvage a disembodied robotic head. But what is initially mistaken for discarded techno trash is in fact the mechanical remains of the M.A.R.K 13: a merciless killing machine programmed to activate, exhilarate and exterminate. After ending up in the isolated apartment of an introverted artist, the M.A.R.K 13 re-assembles itself for an eye gouging, chainsaw wielding, body drilling, skull-crushing rampage where no flesh shall be spared. Inspired by the 2000AD comic strip SHOK: Walter's Robo Tale and Directed by Richard Stanley (Dust Devil), Hardware features a face pounding soundtrack and appearances from twisted rock legends Iggy Pop, Motorhead's Lemmy and Fields Of The Nephilim's Carl McCoy. 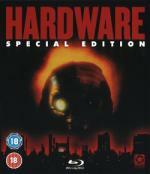 Available for the first time as a special edition, Hardware remains a highly original, mind melding, Cyberpunk, horror/sci-fi cult classic, so plug in, turn on, download and prepare to have your inner circuits pulled out and re-wired. My Thoughts: What can I say which hasn't already been said in the overview? Only one thing that I can think is that the overview fails to mention the stalker. Never managed to see this on release but I was able to buy the VHS in 1991 and watch it then. I remember reading the story, SHOK!, in Walter's Robo Tales in 2000AD and then hearing about this film that copied the main theme of the story. When the video was released the two sides had settled their differences with a writers credit being added to the film for the writers of the comic strip. Overall a good film, very dark with some excellent music, in fact I bought a CD of tracks used in science fiction films to get the Public Image Ltd track amongst others. Achim can you tell me how this one is in comparaison with Dust Devil? Not if the films are alike, but more if the atmosphere are alike. I like Dust Devil (in fact it was one of my best blind buy) and I'm affraid to be deceive if I get this one. I'd say it's still clearly a Richard Stanley film. But, it has different themes and the film therefore unfolds way differently. Dust Devil is a mystic horror film (although I hesitate calling it that) and Hardware is a futuristic cyborg film, where a super-cyborg goes crazs and wreaks havoc (although this description is a bit off, really). I guess what I am trying to say is, that it's not a safe bet. If it's a blind buy based on Dust Devil, I couldn't judge if you'll like this one all the same. Yes Achim it is good that some of these films get their due day in glory. Although some of the features on this disc show that the originals weren't kept well and have video tracking errors. I'll have to look out for Dust Devil as what I've seen it looks quite good, I've caught parts of it on the movie channels but never managed to catch the whole film.